Blast waves are being formed by aerial, surface, or subsurface explosions. The waves propagate in the surrounding media – air and\or ground. In cases of aerial or surface explosion, blast waves are being formed in the ambient air. The waves hit the ground and form a ground shock wave. Ground contraction due to high pressure coming from above followed by rapid expansion may produce a new shock wave, going upward from ground surface. The original wave propagation may be affected as well. Ground movements may also cause fracturing and fragmentation, thus contributing to dust lofting. Suspended dust mitigates aerial wave propagation. All these phenomena, accompanied by ground deformation, make the ground an active agent affecting the aerial shock propagation. 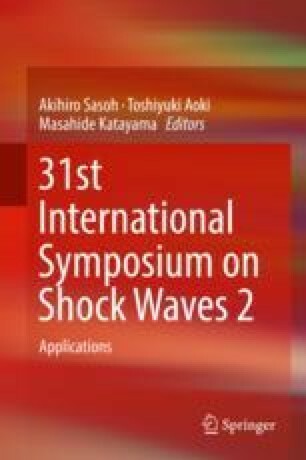 In this study we examine the mechanism of ground wave interaction by means of numerical simulations. To this aim we employ a homemade ALE code, named ParaSALE, which includes a variety of equations of state, strength models, and other material-dependent parameters. Dust lofting scheme is based on Mirels’ analysis and assumptions (AIAI J. 22:1582–1589, 1984). Above some threshold friction velocity, vertical momentum dissipation of the horizontal momentum is converted into a vertical mass flow of dust. If the turbulent mass flux is stronger than the gravitational force, the lofted dust particles are coupled to the flow field and being carried by it (Shao, Physics and modeling of wind erosion, Springer, New York, 2008). Changing ground characteristics affects both the ground dynamics and aerial wave. We simulate both sub- and above-surface explosions with various ground specifications. Effects on crater formation and wave propagation will be presented and analyzed.